The Global Features area enables you to manage options and functions that can be any site in the ESP Admin. Saved Searches, also referred to as Select-A-Searches, are links to already established searches. 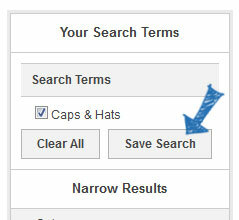 The links act as shortcuts to predetermined product searches, like "caps & hats." To create a new Select-A-Search, click on the "Create New Select-A-Search" button, where you can use the ESP Web Quick Search to create your searches. After you have narrowed your search, you will need to save it. Note: You can further refine your search by using the Narrow Results area under the "Your Search Terms" box. To save this search, click on the Save Search button. A window will open where you can name the search. After naming the search, click on the Save link. You can see a confirmation that this Select-A-Search has been saved successfully and has been added to your list of already existing select-a-searches. Click the "X" to return to the search area. 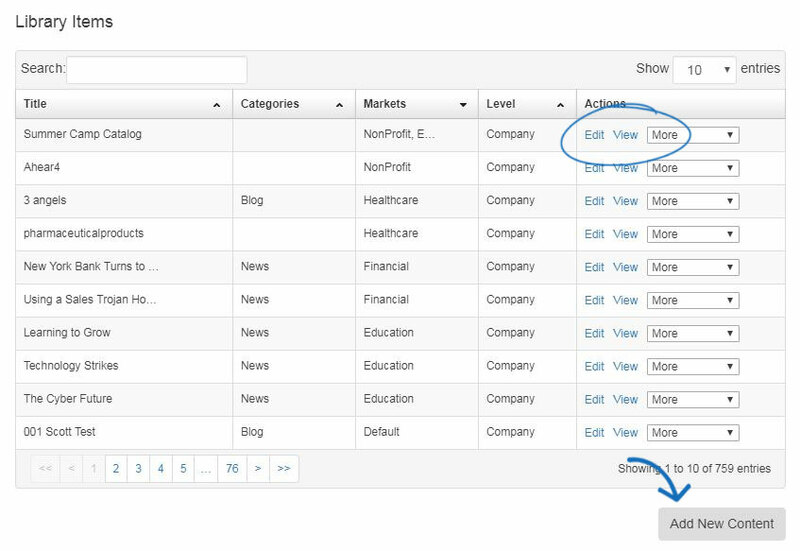 Repeat the steps above to add more select-a-searches to your ESP Website. Once you are finished, click on the "Return to [Features – Select-A-Searches]" link. After you have created your Select-A-Search, you can add it as a link in navigation. 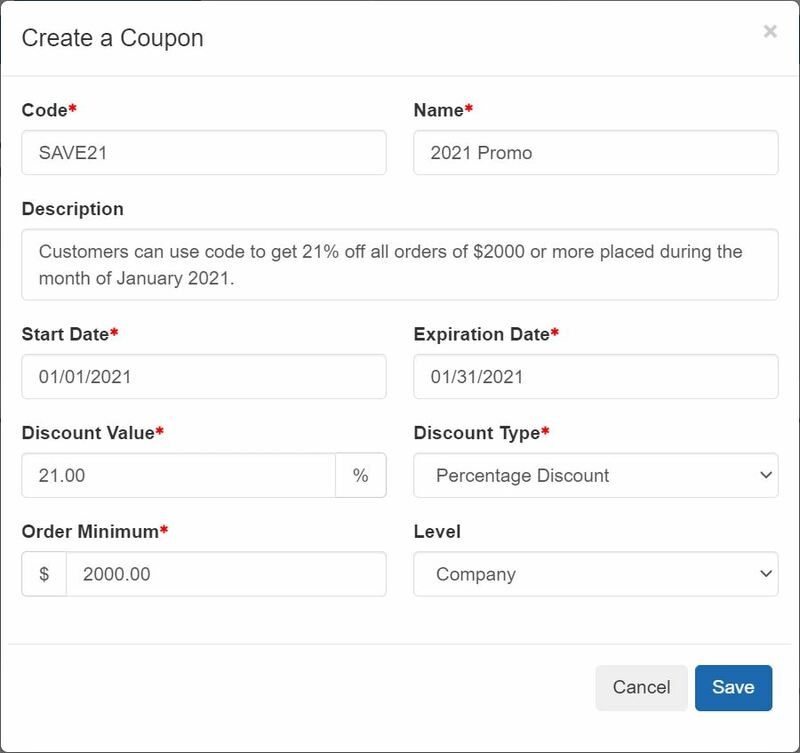 In the Coupon Manager section, you can edit, copy, or delete already existing coupon codes, or create new ones. Within the Coupon Manager, all existing coupons will be listed. 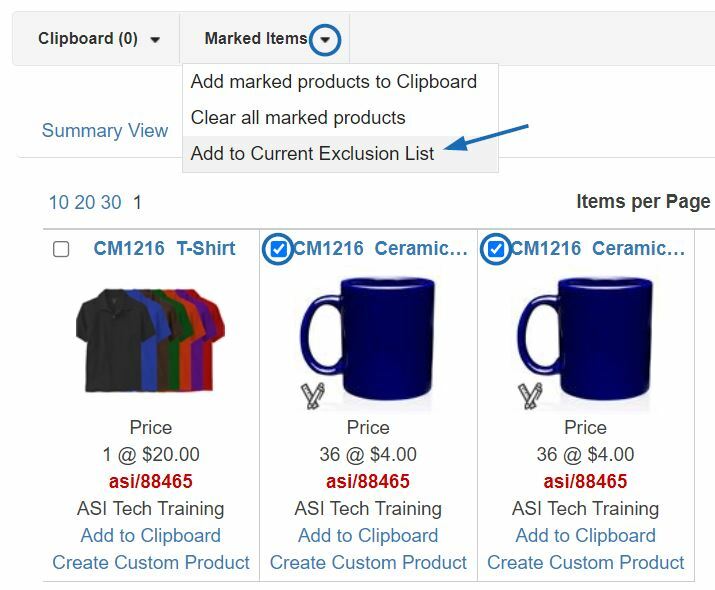 Use the search bar to help you locate an already created coupon or click on any heading to sort in an ascending or descending alphanumeric order. 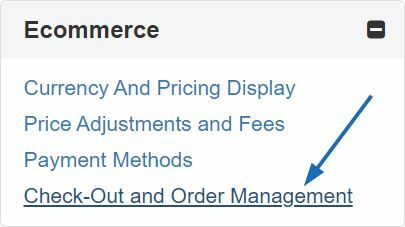 Note: Discount Value and Order Minimum are not clickable columns for sorting. To delete, copy, or edit an existing coupon, select the option using the dropdown in Actions column. Edit: Will open the coupon properties and you will be able to update the information. Copy: Will create a new coupon using the information of the original one. Delete: Will remove the coupon. To create a new coupon code for your site, we can click on the Create New Coupon button. This is the code shoppers will enter during the checkout process on your site. The Coupon Name will be searchable in the Coupon Manager. This information will not be shown on your ESP Website or Company Store, but is for your reference and not a required field. These dates will help determine when the coupon will be active on your ESP Website or Company Store. Type the discount value and then use the Discount Type dropdown to select Amount Discount or Percent Discount. Enter the minimum amount necessary for this coupon to be applicable. The level will determine the visibility of this coupon information to users within your company. When you are finished entering the specifications for the new coupon, click on the Save button. The new coupon will now be added to the Coupon Manager list. The coupon code will be active from the start date until the end date. After locating your site in the My Sites area and clicking on the Edit Site button. Expand the eCommerce section. Then, click on the Check-Out and Order Management link. Go to the Coupon & Points Options section and check the Accept Coupons checkbox. Search & Copy: Enables you to search for product that is already listed on ESP and customize the product information. + Add a New Product: Add your own product data into a blank template. View a webinar on how to add and apply a custom product. To modify an existing product, click on the Search & Copy button. Use the ESP Web Quick Search bar to enter keywords, a product name or a product number. Use the Narrow Results section to refine your search results and locate the particular product you are looking for. Click on the + Add a New Product button from the Custom Products Manager. A window will open prompting you to enter a Product Name, Product Description and Type of Product. Type the Product Name and Product Description in the available boxes. 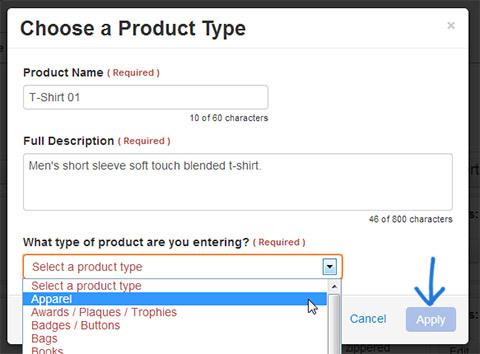 Use the “What type of product are you entering” dropdown to select a product type. Once you are finished entering information, click on the Apply button. To watch a tutorial on how to add this information, please review the webinar below. To create new content for use on your ESP Websites and/or Company Stores, select Content Library from the Global Featuresclick on the "Add New Content" button to create a content block. After you've clicked the "Add New Content" button, or selected pre-existing content, click the Edit Content tab to add or edit your content. You can type new text or update the existing text by using the toolbar (hovering over the options in the toolbar will let you know what each tool will help you accomplish) or switching to HTML mode. To upload an image to your content, click the camera icon from the toolbar. The Media Manager will open. All previously uploaded images from all users in your company will be available in the Media Manager. To upload a new image, click on the Upload Files button, navigate to your image, select it and then click on Open. Your image will be added to the Media Manager. Hover on the image and click Select File to add it to your content. You can repeat this process to upload multiple images. When you are finished making your changes, click on the Save button at the bottom right side of the editor. The properties box on the right is where you can enter the title for your content. You can also attach your content to specific Categories and Markets. For example, you have assigned content in the category of "News" and in the "Automotive" market. 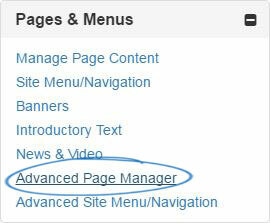 Now, to make this article appear on any page on your site, expand the Pages & Menus tier menu and click on the Advanced Page Manager link. Use the Editorial Content module when adding your content to a page. Then, you can configure the module to display content that is in the category of "News" and the market of "Automotive" to be sure your article will display. Lastly, select a release date so that when you save your content it will be available for use according to the date you've selected. When you no longer wish the content to display, you will need to edit your release date, or remove the content from your web page. After you've finished making changes, click on the Save button under the content window. Once you have finished creating and saving, you can apply this new content to your ESP Website or Company Store. To apply your content to your site, expand the Pages & Menus by clicking on the plus button and then click on the Advanced Page Manager link. To create a new exclusion list, click on the "Create a New Exclusion List" button. Then, fill in the required fields in the Create a New Exclusion List box. 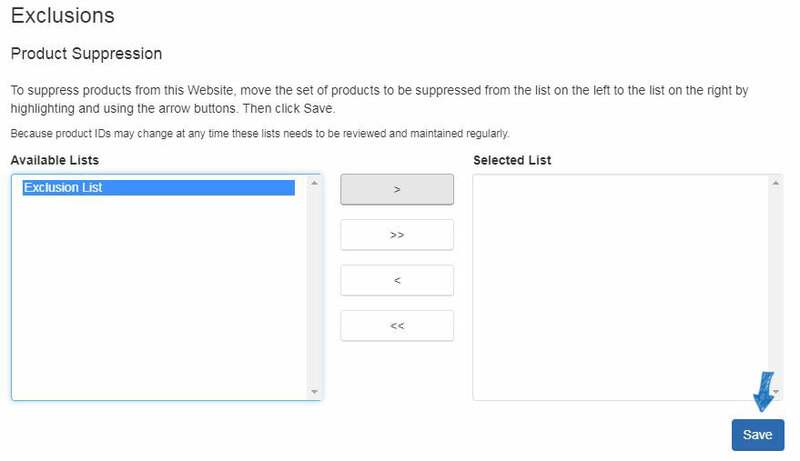 After clicking on Save, you will automatically be taken into the ESP Web Quick Search, where you are able to search for products to add to your exclusion list. When you are finished adding to your list(s), click on the Return to [Features – Exclusion Lists] link. 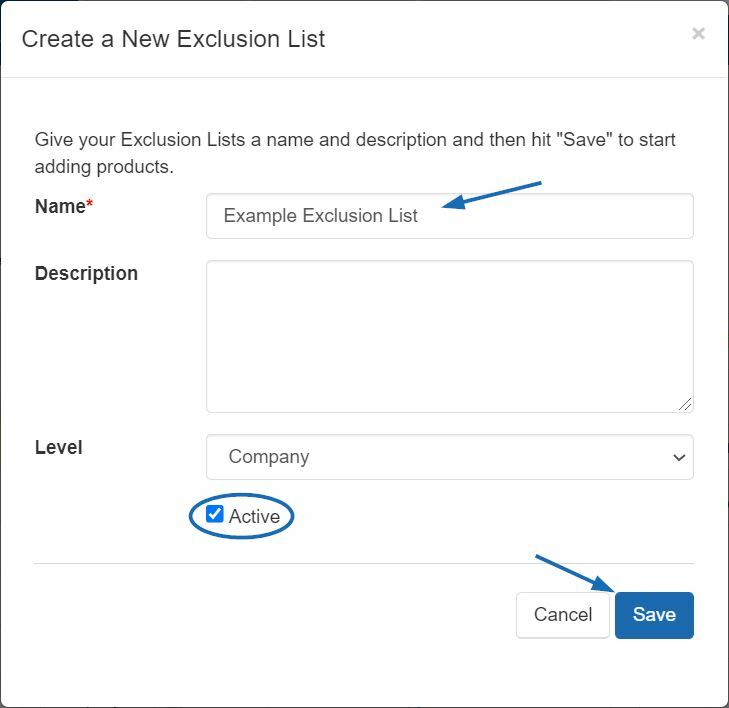 On the Exclusion Lists page, click on the Save button under Properties to save the list with the products you've selected. You will need to apply this exclusion list. To do this, click on My Sites from the Management Toolbar, then locate your site and click on the Edit Site button. 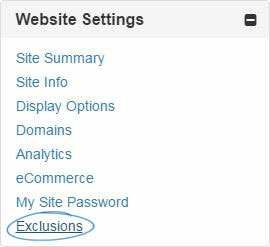 Click on the plus button to expand Website Settings and then click on Exclusions. ESP Websites enables you to limit the categories on your site. 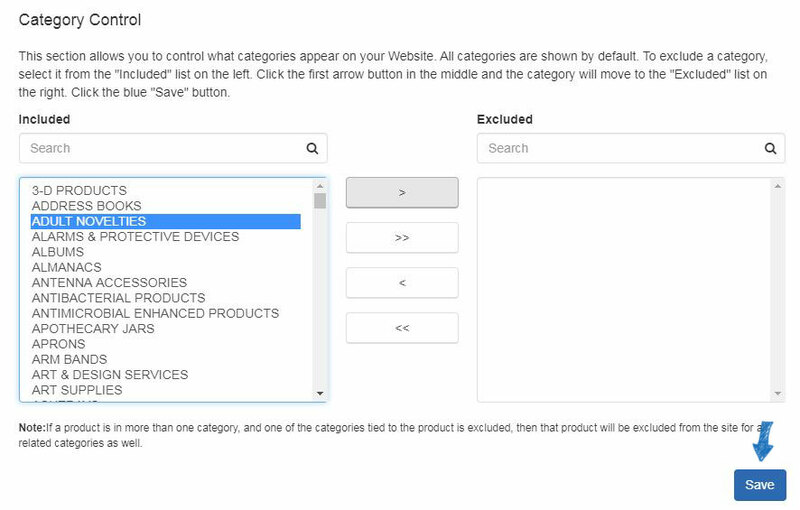 Just like with product lists, click on a category from the options on the and then click on the single arrow to move it onto the excluded list. Coded product numbers are distinct call numbers for products which are individualized for your company. These numbers are different from the supplier's product number. A benefit to using coded product numbers is that the numbers only correspond to products on your ESP Website. This means that every user under your ASI number will have the same coded product number for an item. The Coded Products option in Global Features provides a search for coded product numbers. 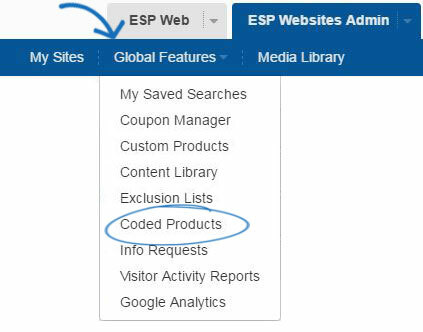 If you have not enabled coded product numbers for your ESP Website or Company Store(s), you will need to do so in the Website Settings - Display Options area. To search for Coded Products or to retrieve the real product number with supplier information, click on Global Features and select Coded Products from the dropdown. Type in or paste the coded product number and then click on Go. The product will be displayed in the Detail view with all information, including the real product number and supplier information. Information requests enable visitors to your site to send a request for more information prior to purchasing. In the Information Request area, you can view the visitors' company name, email, phone number, date they need the product, status of the request, name of your site, and the Action Items. In the Action Items, you can click "Edit" to view the Info Request Details (this will open below the Manage Info Requests section). In the Info Request Details area, you will able to view all of the information that was entered in the information request. You can click on the "Product Info ID" link to view the Product Detail page. You can also change the status of the info request by clicking on the Status dropdown. The status of an info request can be: New, In Progress, or Completed. After you have made your selection, click on Save to save your changes. The Visitor Activity Report section enables you to view information regarding various features on your site and how often they are being used. Select a month and a site using the dropdowns provided. Use the links on the left side to view information for that function. The available functions are Searches and Keywords, Product Views and Shares, Featured Product Sets (Product Collections), and Product of the Day and Banner. 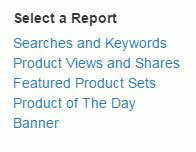 Note: If a feature is not active on your site, it will not be available in the links on the left under Select a Report. To go directly to in-depth information regarding your website statistics via Google Analytics, select Google Analytics from the Global Features dropdown. The Google Analytics website will open in a new tab and you will be able to log in to view all available statistics for your ESP Website and/or Company Store(s).